Nancy Clymer enjoying the water slide at the annual 2013 4th of July picnic. In the future the newsletter will only be distributed by E-Mail. 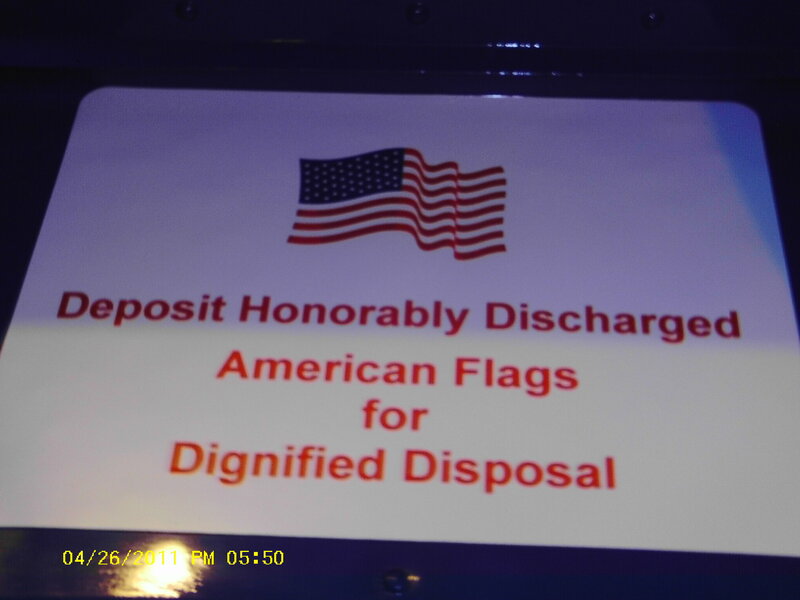 Bring it to Stahl Post 30 and deposit it in our use flag receptical shown below. Need a DD214 the following information will help you obtain one. 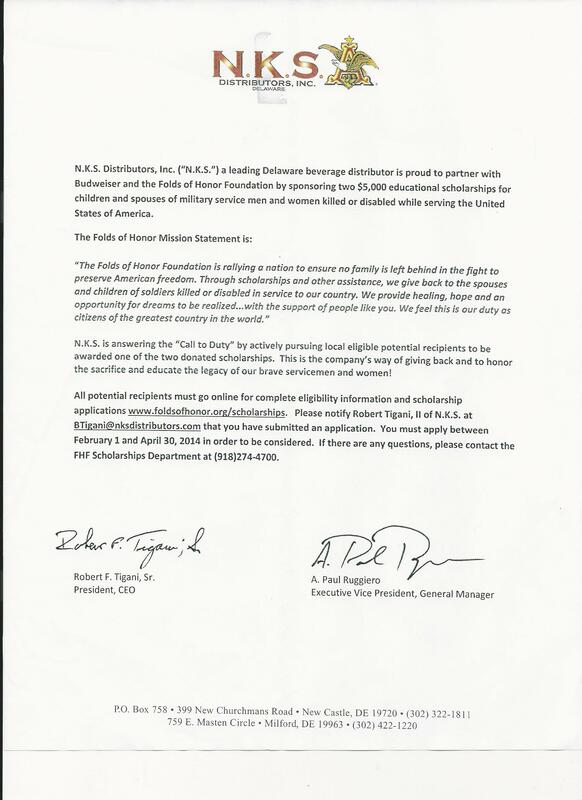 The National Personnel Records Center (NPRC) has provided the following website for veterans to gain access to their DD-214s online: http://vetrecs.archives.gov/ This may be particularly helpful when a veteran needs a copy of his DD-214 for employment purposes. NPRC is working to make it easier for veterans with computers and Internet access to obtain copies of documents from their military files. Military veterans and the next of kin of deceased former military members may now use a new online military personnel records system to request documents. Other individuals with a need for documents must still complete the Standard Form 180, which can be downloaded from the online web site. 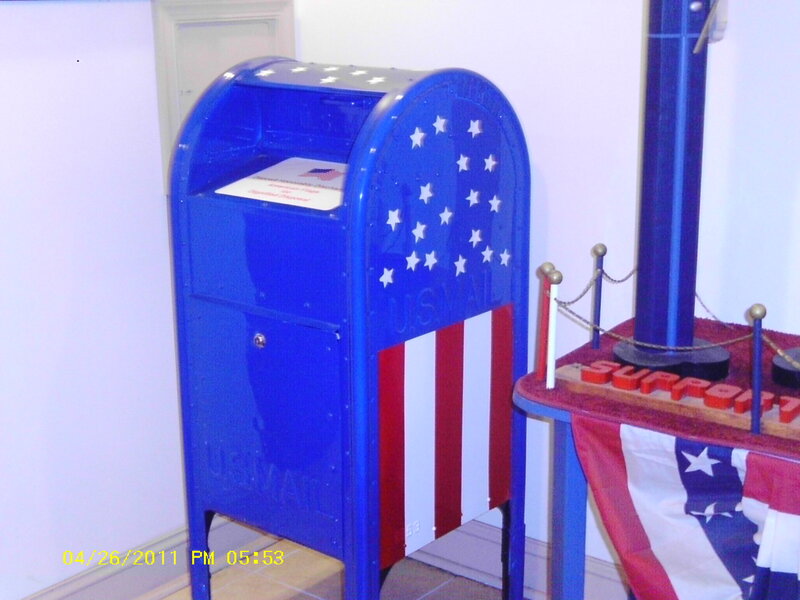 Because the requester will be asked to supply all information essential for NPRC to process the request, delays that normally occur when NPRC has to ask veterans for additional information will be minimized. The new web-based application was designed to provide better service on these requests by eliminating the records center’s mailroom processing time. The Department of Veterans Affairs (VA) has issued a warning to verterans not to disclose personal information over the phone to callers claiming to update, confirm, or verify VA-related information. VA reports the fraudulent caller's mode of operation include asking for credit card numbers, bank routing numbers, and other personal and financial information. A recent fraudulent call reported by a veteran included the caller claiming to be a VA employee and stating that the veteran's medical card had expired. The caller would then ask the veteran to submit a check oner the phone to renew the medical card. VA warns to be leery of any call originating from (888) 555-1234 for it is the number identified in the case above. Veterans with questions about VA services should contact VA at 877-222-8387 or the nearest VA Medical Center. mil address, it is actually from a non-government email account. they are aware of this scam.